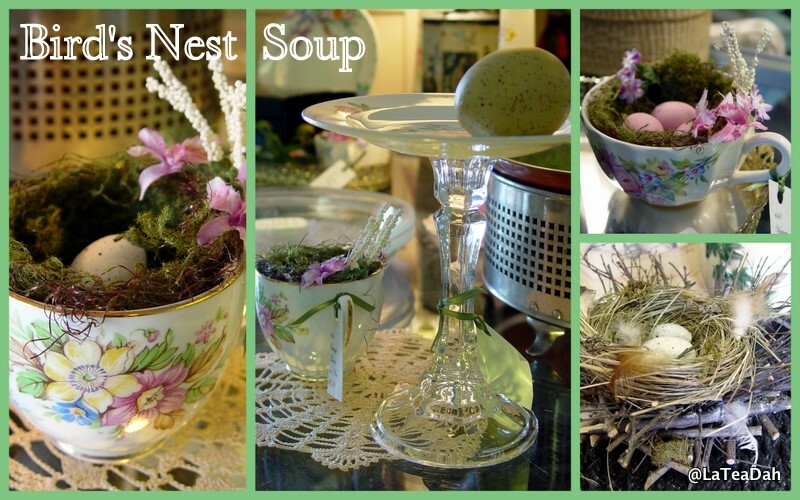 Bird's nests have become popular in home decor. Little ones from craft stores are frequently tucked into accent spots on tabletops, a little shelf, or bookcase. Larger nests can be combined with eggs, twigs and feathers to stand out as a focal point in any room. Sometimes they are hidden under a cloche which can magnify objects and provide them with a sense of glamour or mystery. It's always fun to see how others take this now-common addition to home decor, giving it a new or unusual twist. Recently I discovered these pretty porcelain teacups made into tiny nests. Lined with moss, they were adorned with flowers, ribbon, and lace, and had tiny eggs tucked inside. They made a sweet presentation when added to a pretty vignette. How interesting to see one displayed with a saucer that was securely glued to a crystal candlestick. 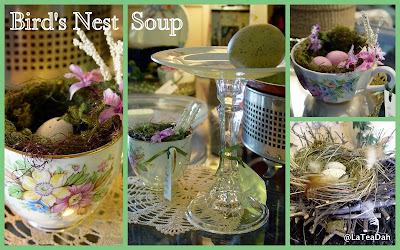 A single, speckled egg at alone on the plate, accenting the bird's nest theme. Little bits of nature, twigs and eggshells working together to add texture and interest to home decor. Feathering the nest has become more than a metaphor as gals create some of the most elaborate nests I've ever seen! Personally, I prefer to stick with what the birds create as their nests delight me to pieces. Love the bird's nests tucked into the cups. What a fun idea. Now I need to go find some. I think we have some in the garage tucked away. Good idea. The little teacup nest is so sweet!